Are Westies Hard to Train? Westies have been dazzling people since the 1700s. According to the American Kennel Club, They were originally bred to hunt rats and other rodents. It makes sense then that they are alert, active, strong, tough and independent. The characteristics that make a Westie a good hunter are the same traits that can present a challenge when you are trying to train one. Since these terriers have a strong prey drive, they will chase a squirrel or any other creature it wants to catch. It’s important for to not be off-leash in open areas. It is important that you make it clear from the beginning that you are the one who is in charge otherwise your Westie will try to be. Because Westies are assertive, stubborn and clever, they can get a little hard to handle if clear behavior lines aren’t drawn. 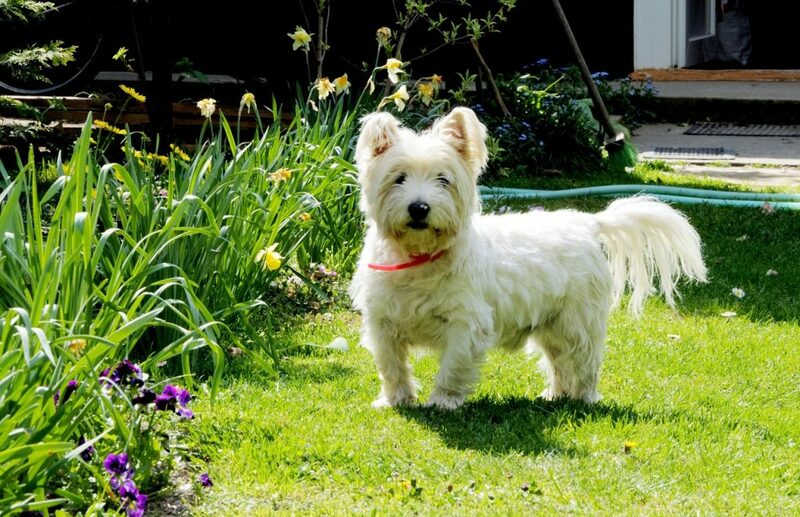 Part of the difficulty of training a Westie isn’t unique to the breed, it might have more to do with the terrier’s diminutive side. The website Pet Helpful says that small breeds often get bad reputations for being difficult to train, especially when it comes to potty training. Pet Helpful cites a couple of reasons why potty training can be difficult for little dogs, like Westies. Generally, most dogs do not like going the bathroom in the main place they live, but for a little dog, the inside of a home is pretty vast. A little dog will sometimes find a place to go in the house, most likely not a place they frequent, like a convenient corner of a room. Another thought is that people treat small dogs differently than they do larger dogs. While no one will tolerate a large dog, like a Saint Bernard, going to the bathroom in the house, they might be more tolerant of a small dog. And that is the problem. The “small dog” theory also applies to issues like jumping and barking. A German Shepherd jumping on someone can lead to an injury, but a Westie jumping up can seem cute. However, it won’t stay cute and can quickly become annoying when you try to welcome guests to your home. If it’s a behavior you would not accept in a big dog, then don’t accept it from your little dog. Though you can feel free to welcome your Westie onto you lap, they are called lapdogs for a reason. While “location, location, location,” is the mantra of real estate, “consistency, consistency, consistency” is the mantra of dog training. It might be surprising, but the Central Intelligence Agency has trained a variety of dogs in their history, though their site doesn’t specify if they’ve trained a Westie. They offer their expertise to the public. Some other keys they point to is the importance of keeping training fun. Also, learn your dog and use what motivates them. The AKC says that Westies are usually pretty motivated by treats, but not all dogs will be. Your Westie might prefer praise. Pet Care Rx, offers many tips for specifically training a Westie, including working on 10 to 15-minute sessions each day on such commands as sit, down and come. Of special concern, Pet Care Rx, advises against any negative training, like harsh voice commands and leash corrections, because a Westie, will not respond well to such treatment and small dogs can even be injured by over-the-top leash correction. Focus on rewards and praise and training will be more productive. Are Westies hard to train? The answer is really up to you. The West Highland Terrier does have some breed characteristics that will pose a challenge, like their stubbornness, independence, and prey-drive, but nothing that consistent training can’t curb. Some dedicated work at the beginning of your relationship with your Westie has a big payoff- a best friend. Why Does My Westie Lick His Paws? How Much Exercise Does a Westie Need? How to Tell if Your Westie is Purebred?